Toll Brothers demand in jeopardy as its main states see property values decline and gross margins shrink. An analyst downgrade could hurt shares, too. While the rest of the market is starting to climb Tuesday, investors in Toll Brothers (TOL - Get Report) can only wish that's what their stock was doing. Shares of Toll Brothers were down 6% before noon after the company missed on both earnings per share and revenue estimates. While order growth was "fabulous," there are some concerns over the company's gross margins, TheStreet's Jim Cramer said on CNBC's "Mad Dash" segment. Toll Brothers stock is still up about 50% on the year, so let's not forget this is still a big winner, he pointed out. However, this is an example of investors ringing the register in a stock that was working and putting that money to work elsewhere. 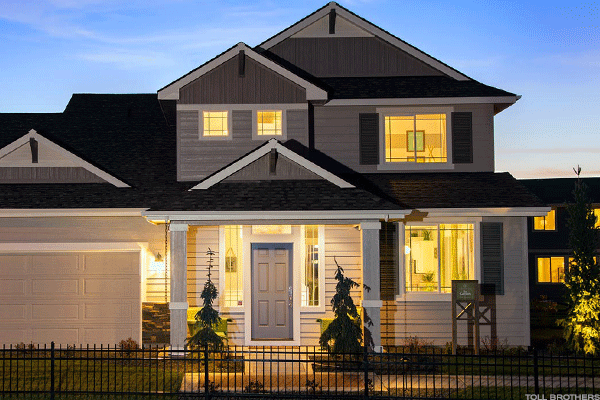 There could be pressure in Toll Brothers stock as investors look to lock in profits. Also, beware of a potential downgrade that could hurt shares in the ensuing days as well, noted Cramer, who also manages the Action Alerts PLUS charitable trust portfolio. Mortgage rates are a double-edged sword when it comes to debating housing stocks. On one hand, as U.S. rates go higher, mortgages become more expensive and thus, could temper demand. On the other hand, rising rates are a sign of an improving economy, which should bode well for housing demand. But one argument that hurts housing? The new tax plan. Certain states, like California, New Jersey and New York could see property values decrease as a result of the new bill, Cramer said. For Toll Brothers, this is bad news as it has plenty of exposure in these states. "It's an untold story that better start getting told," Cramer said, adding that he hates to say property values are going lower, because for many people, their house is their main investment. The inability to deduct state and local taxes could hurt housing demand in these places too, as states with little or no state taxes suddenly become even more attractive, he concluded.